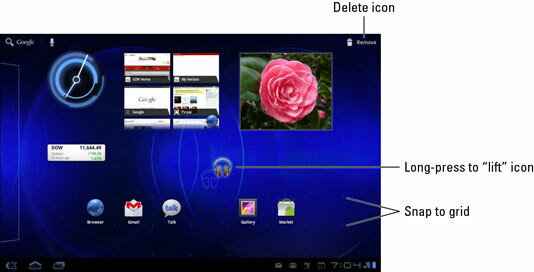 Icons and widgets are fastened to the Samsung Galaxy Tab Home screen by something akin to the same glue they use on sticky notes. You can easily pick up an icon or a widget, move it around, and then restick it. Unlike sticky notes, the icons and widgets never just fall off. To move an icon or a widget, long-press it. Eventually, the icon seems to lift and break free. You can drag a free icon to another position on the Home screen or to another Home screen panel, or you can drag it to the Remove (trash can) icon that appears at the top right of the Home screen. Widgets can be moved around or deleted in the same manner as icons. Dragging a Home screen icon or widget to the Trash icon removes the icon or widget from the Home screen. It doesn’t uninstall the app or widget, which is still found on the Apps Menu screen. In fact, you can always add the icon or widget to the Home screen again. When an icon hovers over the Remove icon, ready to be deleted, its color changes to red. Your clue that an icon or widget is free and clear to navigate is that the Trash icon appears.